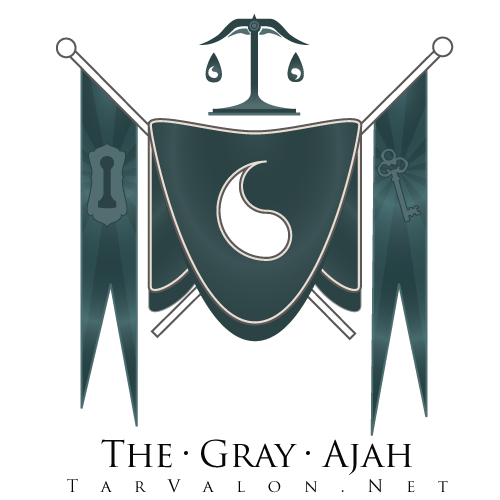 The Gray Ajah is a very diverse and very close group of women here at TarValon.Net. Our members are scattered around the world, in South Africa, Australia, Israel, Serbia, Sweden, Scotland, Bulgaria, England, Canada, France, Belgium and the USA. The age of the Ajah is across the board, with our youngest member in high school, and our oldest mothers to children in high school. We are very different in many ways, but we are all alike in our regard and care for each other, and in our desire for peace, love, and understanding. The women of the Gray Ajah believe that most anything can be prevented or solved by open, clear, and honest communication. We all live by a No Drama policy, both on the boards and in our real lives. In sharing this ideal, we connect on a deeper level that creates an environment of trust and acceptance. We care about each other and are as communicative on the boards as we are via text message, phone call, and the occasional meeting in real life. As a whole, we are a rather spammy Ajah, though we have many ongoing threads in our forums where we get to know each other better. We are an active Ajah, releasing a newsletter and hosting a Gray Chat weekend each month, as well as planning site-wide games and activities. We like to make new members and guests to our Ajah feel welcome, because we know how important it was to us to have people welcome us when we were new to the site. The Grays are always looking for a fun time, and we enjoy making others laugh. ::: What are the differences between the Gray Ajah from the books and the TarValon.Net Ajah? In terms of philosophy or ideal, we're fairly similar. We strive for peace and for balance. For the Grays in the books, it was the peace of nations. For the Grays here at TV.Net, it's the peace of everyday relationships. We aren't as political as the book Grays are; we work on a more microscopic scale, with relationships instead. And many of our members have been known to say that they know all the rules inside and out so that they know how to get around them. One of the main differences between the Grays of the books and the Grays of the site is demeanor. None of the main Aes Sedai in the books are Gray. Until the last couple of books, the Grays are largely overlooked. And when you finally get to spend more time with a Gray character, you find that many of those characters are either painfully flawed in some way or they're Black Ajah. For many of the TV.Net Grays, we didn't even consider the Gray Ajah in the first place, probably because of the representation of the Grays in the books. And, of course, there's the pie and wheelbarrow things, which the book Grays definitely don't have. March 21, 2019 We have a new Aspirant! Welcome Lokadien Vianharl!! February 14, 2019 On this day, under the Light, have been bonded Maibella ni Rhoiden t'al'Varrak and Dnae Ila!! October 8, 2018 Congratulations to our new Head of Ajah, Siera al'Cere!! October 07, 2018 Thank you to Ilverin Matriam and Imzadi Hopewind, our outgoing Sitters, and congratulations to Gray's Fall Term 2018 Sitters: Ilverin Matriam and Maibella ni Rhoiden t'al'Varrak!! August 11, 2018 Congrats to Alyssa Letherio and Reniel Killan, who have bonded today!! !